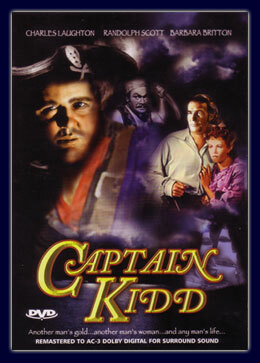 I didn’t exactly have high hopes for this film, partly because it features a rather robust, unintimidating looking actor as Captain Kidd, but mostly because I bought it at Walgreens for about three bucks. As it turns out, I was in for quite the unexpected treat. Captain Kidd, as played by Charles Laughton, is rather atypical for a Hollywood pirate – more large and lazy than swashbuckling, he can nontheless fight when need be, and he conveys a brutishly scheming demeanor that makes his character surprisingly believable as a leader of cutthroats. Laughton really shines in this role, and I was delighted to learn that he portrays Kidd again in the film “Abbott and Costello Meet Captain Kidd”, which I must rent immediately. I won’t go into further detail for fear of spoiling the fun. Suffice to say this movie has all the necessities – buried treasure, betrayals, revenge, fencing, death lists, and even an unrepentant, beligerantly brilliant final speech at the hangman’s post. Definitely rent it, or better yet, go to Walgreens and buy it with your milk money. Worth every dollar! This entry was posted in Movies / TV and tagged captain kidd, historical-inspired by Bilgemunky. Bookmark the permalink.